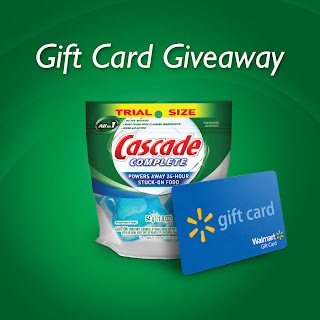 the life of a wife: Walmart Gift Card GIVEAWAY! Last week I received a sample of the Cascade Complete All-in-1 ActionPacs, provided by P&G through MyBlogSpark. I have always been skeptical of dishwasher detergents that claim to work without pre-rinsing or pre-soaking. To really test how well this one worked, I made baked spaghetti in a white Corningware dish and served it on white Fiestaware plates. I then let those dishes, along with our utensils and salad bowls, sit for 24 hours without rinsing them. All of the dishes had spaghetti sauce and food caked onto them, but I used a Cascade Complete All-in-1 ActionPac, and all of the dishes (the ones placed on the bottom rack of the dishwasher) came completely clean! I was so pleasantly surprised. For trying their product, P&G also provided a giveaway for you all. to those with a U.S. mailing address. Winners will be randomly selected and announced on Thursday. a sample of the Cascade Complete All-in-1 ActionPacs. Legal Disclaimer This product review was based on using complimentary Cascade product provided by P&G. 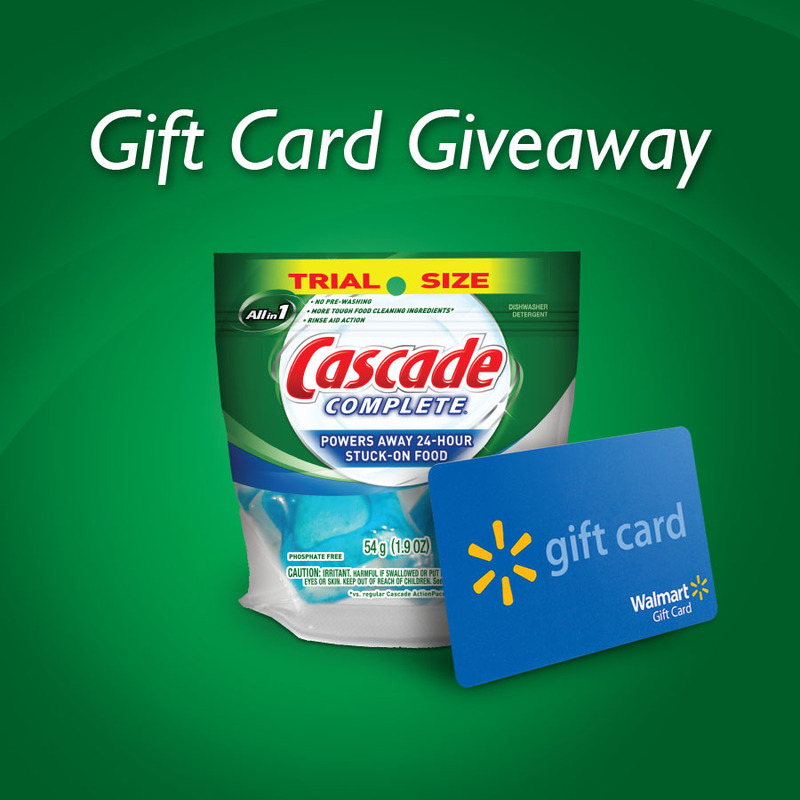 Bloggers also received a Walmart gift card to share with their readers. P&G does not represent or warrant the accuracy of any statements or product claims made here, nor does it endorse any opinions expressed within this blog site. how brave you were to leave spaghetti sauce on your white dishes! i really dislike scrubbing macaroni and cheese off a pot if it's been sitting overnight...that or eggs, gross. I hate cleaning up after anything baked in the oven. It's the worst! On the top of the list is probably breakfast casserole , because the bread gets all soggy. ick ! Let's try this again (pesky Blogger!) I don't have a dishwasher in my apt so anything that turns to concrete after sitting for 30 seconds or 3 hours drives me up a wall and I get so annoyed trying to clean it! My mom has one of those can wash anything off a plate dishwashers and I love being at home for that (and many other reasons)! I hate cleaning up after lasagna. I think it might have to be Lasagna!! Thanks for the chance to win! hate cleaning up after scrambled eggs! I hate cleaning up after casserole meals :) Things are stuck to the pan, and it's just generally difficult to get off! I don't like cleaning up after oatmeal! I really hate scrubbing my big pot that I boil chicken in, especially if I've let it sit too long. All that nasty chicken crud just won't come off without an SOS pad, and then my hands smell like metal- gross. Muffins pans when I run out of baking cups! i hate cleaning up after cooking spaghetti! I hate cleaning up after Scrambled eggs they are a booger to clean!!! I follow you on gfc!! !